1) WSOH-7 is a Free Pro Football Contest with *membership options ($25 a season). *Note: You must be 21 years of age or older to win or claim a prize and you must of purchased your membership option before the start of Week 4 (Sept 27th, 2018) to be eligible to win the grand prize of the Ring. However, players who purchase their membership after Sept 27th, can still claim the weekly prize. 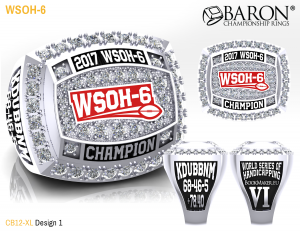 1st Place Winner: WSOH-7 Ring + $1000 in Cash! *Note: You must be a WSOH-7 member to be able to claim the 1st place prize of the Ring and Cash.